Slugs sick me out. They make me want to vomit. If you’ve never stepped on a slug with your bare feet and felt it pop, you might not be emotionally equipped to understand what it feels like to truly hate a slug the way I have come to hate them. That being said, I’ve made it one of my many diverse missions in life to help my kids be okay with slugs. Maybe this is disingenuous. I prefer to think of it as positive psychology or self-deception for the greater good. So, Wanda is convinced that she loves slugs and they love her back. She talks to them, adopts them, cries when we wake up to a slug-free morning. One thing she never does is touch them. This is telling. I can say I think a boy is cute, but if the thought of touching him makes my skin crawl, I probably don’t like him all that much. So, last night Wanda left her shoes out on the lawn by the trampoline… so the balls and shovels and popsicle sticks wouldn’t be lonely. Tonight when she was coming in after a parentally-mandated, screaming-fight-with-her-brother-motivated cease and desist order, I told her to bring in five or ten shoes from the area around the trampoline. These were not screams of delight. They were screams of terror. They were screams filtered through tears, shaky tears. I couldn’t help laughing. I could help taking a picture of her distress but I chose not to. My favorite part is probably the position of her fingers as she tries to hold the shoe with as little of her hands as possible. 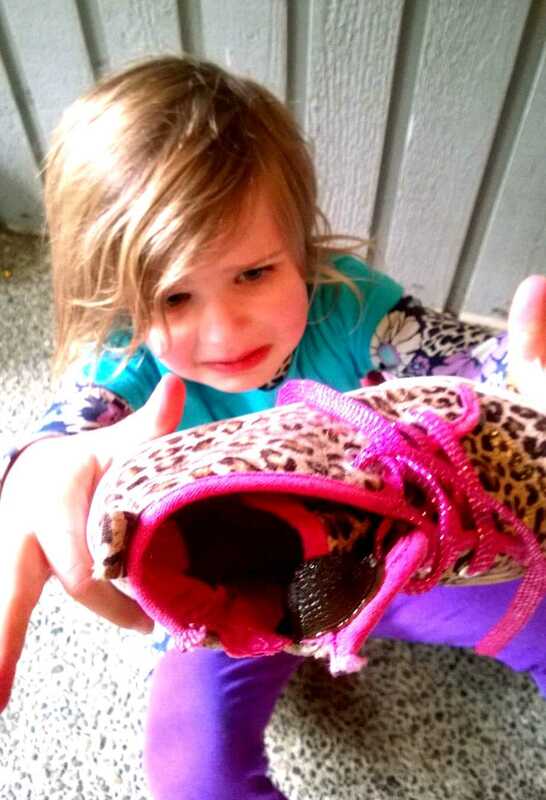 Eventually, I made my way out to the front porch to shake the slugs out of her super fast cheetah shoe. Four slugs people. Four invaders. Or so I thought. One more slug had somehow clung to my person as I came inside and several minutes later Laylee noticed it shlumped on the middle of the living room rug. She left to grab the tissue. She returned with hands full of half a roll of paper towel, bunched up into a toddler-elephant-sized wad. She giggled nervously. But she bravely did the deed. Slug friend was disposed of and we salute the many trees who gave their lives so our house could be free of living slime. When we say our family prayer each night, every person gets a chance to say one thing they’re thankful for that we then incorporate into the prayer. We were at a friend’s house today when Wanda saw a horrific sight over my shoulder. It was a sight that made her startle, gasp and clasp her hands over her mouth, her eyes wide. Indeed. She was sitting on the train tracks. 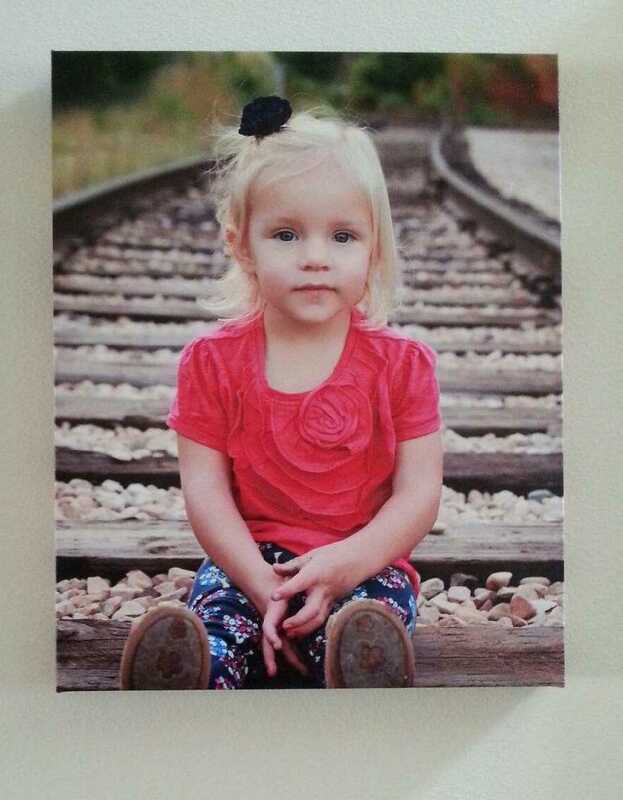 My diabolical friends had posed their adorable child at death’s door because they thought it looked cute. Maybe they’re thrill seekers. Maybe they hate safety. Whatever the reason, they put their family in great peril, took pictures of it, blew them up huge on canvas and hung them on their walls. The look on Wanda’s face said it all. What next? We could take a picture of Laylee hanging by three fingertips from a cliff wall or Magoo juggling chainsaws, smoking a stogie, or riding in a car with no seatbelt and hang those on the wall. Twisted. Very twisted, my friends. I’m serving up a little introspection over at HowDoesShe.com today, courtesy of Magoo and a belching contest. You’re welcome.